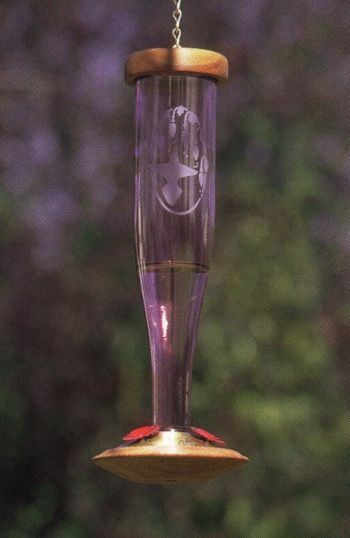 This amethyst model humming bird feeder features the kiln fired luster of precious metals to obtain the shimmering colors. It is extremely durable. The cap and base are lathe turned by hand. The dish cover is solid brass with 3 kiln fired, red powder coated copper flowers attached as the feeding ports for these humming bird feeders. The etchings of these hummingbird feeders are sand blasted by hand from original drawings by Gary Schrodt.